There is a critical shortage of quality affordable housing in the City of Detroit, Mack-Ashland II is an important contribution to help address this need. Mack-Ashland II is the second phase of a larger Mack-Ashland Community Revitalization Initiative happening in the Eastside Neighborhood of Detroit. Mack-Ashland II provides 28- units of affordable housing, in 14 townhome buildings. The location of Mack-Ashland II is key to the impact the project has on the residents. Residents of Mack-Ashland II have the benefit of living in a neighborhood central to retail, public transportation and public schools. The Mack-Ashland II homes are located within 50 to 500 feet from several public transit routes, from neighborhood retail centers, coffee shops, restaurants, grocery stores, banks, churches and parks. Each building has a full basement, landscaped yard and parking available on a side driveway. Tenants moved in the first week of April 2017. Eight of the units are set aside as permanent supportive housing, these units are available to residents who are chronically homeless, mentally ill, victims of domestic abuse, veterans and youth aging out of foster care. The units will receive Michigan State Housing Development Authority (MSHDA) Project Based Vouchers (PBV). PBV program targets extremely low income supportive housing populations and is federally funded by the United States Department of Housing and Urban Development (HUD). Residents will have access to the Northeast Guidance Center (NEGC). Through a relationship with Southwest Housing Corporation, Northeast Guidance Center will provide innovative, community-based services that promote total wellness with an emphasis on behavioral health not only for children, but also for adults and families. NEGC provides exceptional services to the Mack-Ashland Phase I residents and will provide counseling services to Mack-Ashland Phase II. NEGC is a 51-year old community-based behavioral health agency providing comprehensive services to individuals diagnosed with mental illnesses. There is a full-time case manager assisting the Phase I tenants, and the outcomes include; 18 tenants who are employed, 11 tenants attending school full time, 23 tenants participating daily in NEGC services and several tenants graduating college. 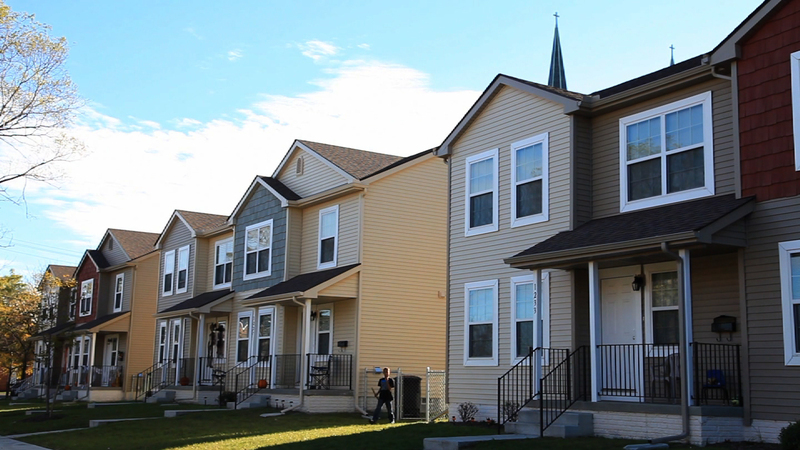 The Mack-Ashland II project has been designed around the vision of creating a community, a safe place for families to share and create lasting memories. An additional building within the development will house the property managers unit and community space. The first floor of the community space will feature a large communal kitchen, dining room and a large activity room. There will be a classroom and reading room located on the second floor and the basement will include a children’s play room and an exercise room for adults. At the time of grand opening in June of 2017 there will be two community gardens in full bloom. One garden will feature a kid’s playground and the second is intended for passive recreation and will have raised garden beds and benches. Before the Mack Ashland Community Revitalization Initiative, the there was little opportunity for decent housing within the Eastside Detroit Neighborhood. The new construction has replaced rundown single family homes and vacant lots, without displacing the families that live in neighborhood. Southwest Housing Corporation plans to improve existing owner-occupied homes adjacent to the Mack-Ashland II site. Through a three phase project development, Mack-Ashland I-III, Southwest Housing Corporation is committed to revitalizing Detroit’s Eastside Neighborhood. As has been demonstrated from the success of Mack-Ashland I and Mack-Ashland II, they are sure to accomplish this vision. In 2013 Mack-Ashland I (Phase I) of the Mack Ashland Community Revitalization Initiative was completed, this included the development of a 39-unit building comprising studio, one bedroom and two bedroom apartments with commercial space on the ground floor. Currently all units are occupied. Mack-Ashland II (Phase II) is located behind the Mack Ashland apartment complex. Mack-Ashland III (Phase III) will be completed in the coming years and will continue to have a positive impact in the neighborhood. Ultimately, what has been created is a family friendly community, that is very desirable to live in. Providing opportunity for safe affordable family housing, where there wasn’t before.